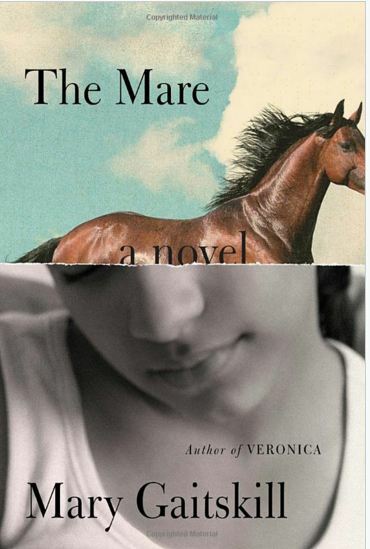 Mary Gaitskill's The Mare is the earnest and deeply touching portrayal of how strong and affectionate bonds can be formed between people from really diverse backgrounds as their lives intertwine. Through The Fresh Air Fund, eleven-year old Velveteen Vargas (the name is an obvious reference to National Velvet), a spirited Dominican girl from Brooklyn, lands in the home of Ginger and Paul, a middle-aged intellectual couple living in the countryside. They are highly privileged compared to Velvet's circumstances: Ginger is an artist and Paul is a professor, whereas Velvet comes from a struggling household: her mother, Silvia, barely making ends meet, not even speaking English, raises her and her little brother, Dante completely alone. Silvia lavishes all her affections on Dante, and is at times shockingly abusive of Velvet, both physically and emotionally; she pushes her daughter away even though it is repeatedly revealed how anxious she is about her. This relationship is juxtaposed with the one forming between Velvet and Ginger: an altogether warmer and more nurturing version of the mother-child relationship, one which is ambivalent in a different way, and in which both Velvet and Ginger are eager to meet each other's needs and heal emotional wounds, including their own. Ginger lavishes all her affections on the little girl, who in return soaks in this loving attention, as is shown in an early scene when they are in the playground: „She did everything with enchanted hunger, like she was maybe too old for this but wanted it anyway, because she knew it was something she should've had" (p. 28.). Ginger thrives as well, enjoying her new role, which she feels also provides a validation for her in the eyes of society, especially as regards Paul's ex-wife and daughter. From the onset, there are other dynamics affecting this relationship. Velvet herself, deeply loyal to her mother whose love she craves with heart-breaking despair, instinctively searches for balance so that the connection she has with her host family does not emerge as the superior or dominant one. Silvia sways between feeling distrust for Ginger, whom she regards as „more girl than woman" and recognising, however reluctantly, the benefits Ginger's presence brought to their lives. And Paul, Ginger's husband, doubts whether Ginger has the right to develop such strong emotions at all towards someone she is not related to. The book depicts how Velvet and Ginger become catalysts in each other's lives. As Ginger – a failed painter and recovered alcoholic – becomes increasingly involved in Velvet's life, she gains courage to dig into the deeper layers of her own personality, and to face and be reconciled with her own painful past. On the other hand, her attachment to Velvet develops into another kind of dependency, focusing on the girl almost with an obsession: she does not even realise her marriage is disintegrating until Velvet's questions redirect her attention to her husband. And Velvet's life is changed ultimately when she enters the world of the stable next to Ginger's home and becomes enthralled by a difficult, abused horse, Fugly Girl. For the little girl, the most healing connection does not come from another human being but from the horse itself, the mare whom she eventually tames and renames Fiery Girl. The strong bond Velvet forms with the horse, and the self-discipline she needs to attain in order to earn the mare's trust, help her through her painful experiences. Gaitskill depicts with empathy Velvet's path toward emotional maturity: how the vulnerable little girl – longing, mostly in vain, for connection and acceptance, struggling with low self-esteem, confronted with constant rejection from her mother, and suffering true heartbreak from a reciprocated, yet impossible love – finally realises: despite her essential loneliness, neither her body nor her spirit are broken, she can heal herself and her horse, and she has the ability to win at the race. The narration alternates mainly between the viewpoint of Velvet and Ginger, although other characters – Paul, Silvia, Dante, a horse trainer – also gain a voice at some point. This technique reveals that both Velvet and Ginger develop into unreliable narrators, not for the reader but for each other: as their lives become increasingly complicated and there is less which can be directly shared with the other, they try to interpret from small signs and evidence what is going on in each other's lives. As the book progresses, with Velvet's puberty and Ginger's "going down", as she herself puts it, in spite of their mutual affection, they grow apart and their connection weakens, both bodily (Velvet no longer enjoys leaning against Ginger) and emotionally (sometimes misreading each other completely). The text shows no sign of sentimentality while it investigates emotions in their raw authenticity. It withholds judgement, and portrays its protagonists with compassionate observation. It is a courageous book about love, needs, boundaries, and whether we need justification to love; it is somehow sombre and powerful, beautiful in its robustness, just like Velvet's horse itself.